Dental caries remains one of the most common diseases throughout the world. Although caries has affected humans since prehistoric times, the prevalence has increased greatly in the modern times worldwide, an increase strongly associated with dietary change. The course of caries activity is not always predictable. The carious lesions occur only under a mass of bacteria capable of producing a sufficiently acidic environment to demineralize tooth structure. Acids demineralize the enamel covering of the tooth crown or the cementum covering the root and then the underlying dentin. Dentin is a vital tissue containing the odontoblast processes, and this tissue will react to the transmission of stimuli from the oral cavity through the microporous enamel. 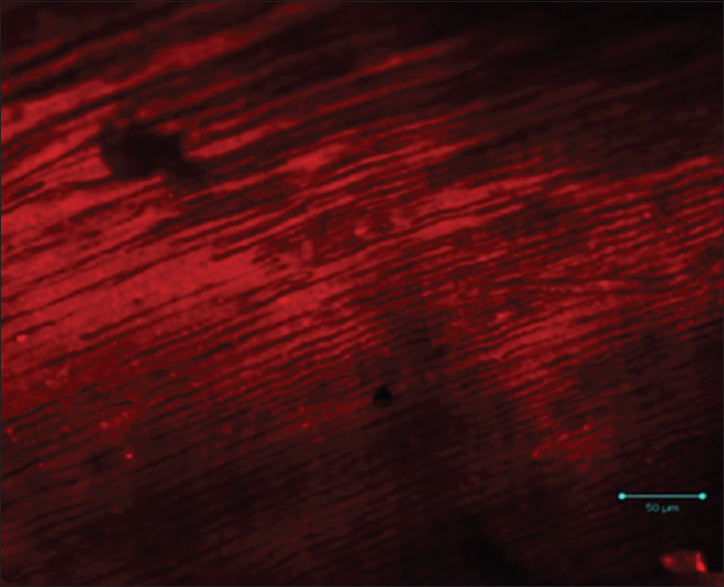 The most common defense reaction by the pulp–dentin complex is the deposition of mineral within the dentinal tubules.,,, This is called “tubular sclerosis” or “translucent dentin” because, due to reduced light scattering, the tissue appears translucent histologically when examined in transmitted light, and the process requires a vital odontoblast. Study of the disease progression is always vital in understanding and treating the disease. Dentin morphology and the lesion found in dental caries have been studied for many years. Initially, it was first observed using optical microscopy and later using electron microscopy with decalcified or ground section methods of carious teeth. Three-dimensional (3D) observations of carious tooth have not been studied with light or electron microscopy as thin sections are difficult to prepare serially, due to the low organic content of the enamel and dentin. Confocal laser scanning microscopy (CLSM) is a relatively new technology, using a nondestructive technique, which provides 3D images.In vitro studies on secondary caries and tomography image of the interface between enamel and dentinal restorations have been studied using CLSM. 3D observations of carious teeth using fluorescent dyes such as calcein, tetracycline, and rhodamine have been used for staining and analyzing the morphology. 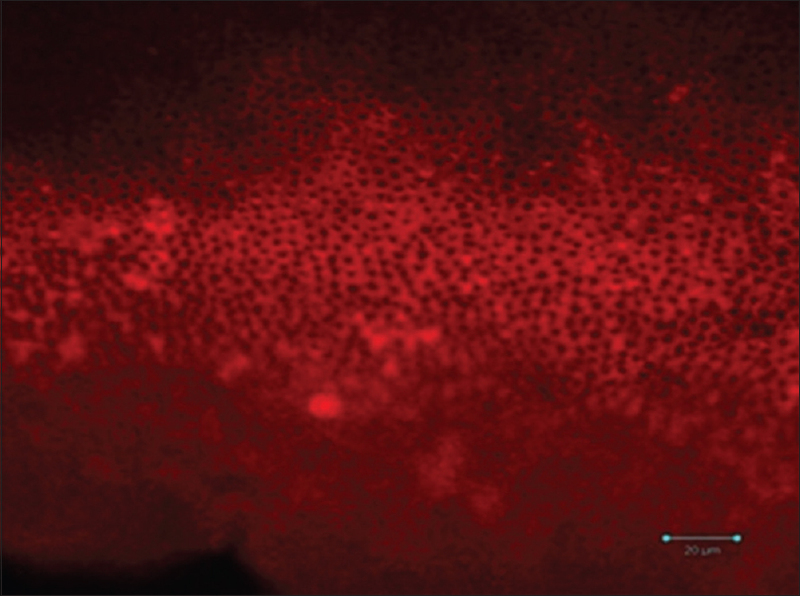 Alizarin red is one of the fluorescent dyes used for vital staining of calcified tissue. It is used in a biochemical assay to determine the presence of calcific deposition by cells of an osteogenic lineage, quantitatively by colorimetry. It is an early-stage marker (days 10–16 of in vitro culture) of matrix mineralization and sometimes used to demonstrate calcium in sections. The use of alizarin red to study normal dentin was first proposed by Kagayama et al., and not many studies have been published on 3D observation of carious teeth using alizarin red. Hence, the aim of this study was to examine histopathological findings obtained from CLSM in human dentin caries and analyze the morphological characteristic changes of the dentinal tubules stained with alizarin red. Thirty freshly extracted human premolars and molars affected with dental caries were selected and obtained with informed consent from the patients. The teeth were cleaned from visible blood, scaled, disinfected, and consequently fixed using 10% formalin for 5 days. Specimens were then dehydrated using increasing grades of ethanol (60%, 80%, 96%, and 100%) (Merck, South Africa), 24 h for each step. Teeth were then embedded in acrylic cylinders and sectioned longitudinally and cross-sectionally using a diamond disc mounted on a slow-speed handpiece and sections with a thickness of 100–200 micrometer were obtained. Subsequently, all the specimens were polished with increasing grits of fineness on a silicon carbide paper (400#, 600#, 800#, and 1200# each). All the specimens were then stained by immersing them in alizarin red-S (100 μg/ml) in 0.5 M HCl solution for 24–48 h at 37°C, which was then mounted on a glass slide. Images were captured out with a confocal laser scanning microscope (LSM-510 META; Carl Zeiss, Jena, Germany) using ×20/×0.4 and an argon gas laser source with excitation band at 512 nm under epi-fluorescence mode or transmission light mode. Histopathologic images were recorded within the specimens and standard settings for contrast, brightness, and laser power were used for all images. All the images were then subjectively analyzed. All the examined ground sections of the teeth in this study showed histopathological changes of caries with varying degrees, which revealed dentinal caries. 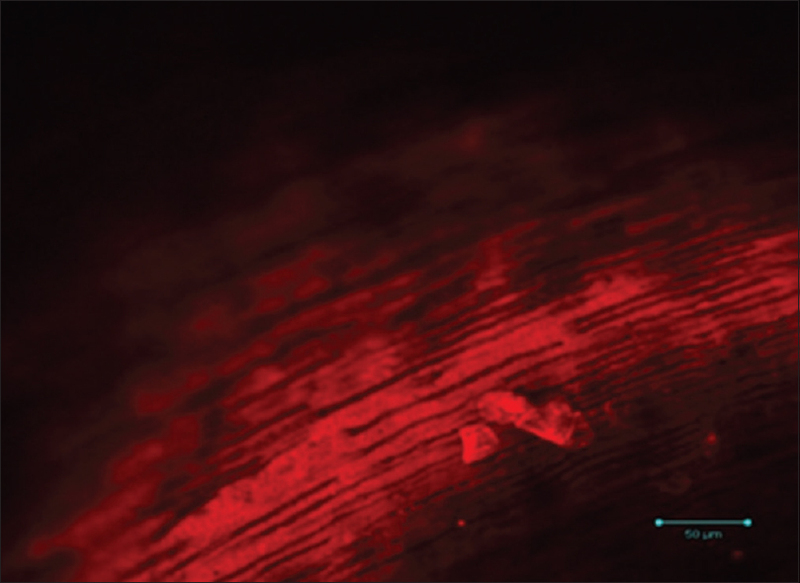 All the samples showed areas of normal dentin zone (N) where dentinal tubules were condensed and thick and translucent zone (T) where dentinal tubules were thin and loose [Figure 1] and [Figure 2]. The dentinal tubules in translucent zone appeared as circular tubules in the cross-sectional areas, whereas areas of demineralized dentin appeared to be dark. Only a few dentinal tubules were stained in the translucent zone, where the outline of tubules remains visible and central zone appears translucent. In longitudinal sections, dentinal tubules at translucent zone were thin and smaller when compared to the normal area. The images also showed Type I dentinal tubule appearing thin and translucent and Type II dentinal tubules which appear thick and nodular due to reactive dentin formation, which were clearly evident in [Figure 3] and [Figure 4]. The dentinal tubules also appeared like bamboo with many nodules in longitudinal sections and had numerous branches at the normal area [Figure 5]. Enamel is a highly acellular and avascular structure which cannot respond to injuries; whereas, the dentin is an integral part of the pulpo-dentinal organ and considered a vital tissue which not only can withstand the progression of dental caries, but also can induce a repair from those insults even before the dentin is breached. Although many researchers have attempted to study the morphological patterns of dentinal caries, none of them could get a 3D view of caries progression; 3D observations of carious tooth cannot be studied with light or electron microscopy and thin sections are difficult to prepare serially due to the low organic content of the enamel and dentin. The current study used CLSM which is a relatively new device, using a nondestructive technique providing 3D images of the structure. The current study used CLSM to view the morphological characteristics of dentinal carious lesions stained with alizarin red as a stain, as alizarin red was used as an early-stage marker of matrix mineralization and sometimes also used to demonstrate calcium in sections. Since dentin is composed of calcium substance, alizarin red can be used to determine the presence of calcific deposition. The cross-sectional images showed nodules which appeared as circular tubules surrounding the dentinal tubules. The circular tubules may correspond with a circle of dense staining at the border between the peritubular matrix and the contents of the dentinal tubule. The peritubular dentin is present at the middle part of the coronal dentin, and the distribution of Type II tubules resembles that of the peritubular dentin. It is suggested that the nodules are the structures related to the peritubular dentin. Within the limitations of this study, it was found that dentinal tubules in the crown had nodules, and also alizarin red staining will be useful for the observation of the structural characteristics of dentinal tubules. Further studies are required to demonstrate the presence of these nodules in the radicular dentin. Roberson T, Heymann H, editors. Swift. Studevant's Art and Science of Operative Dentistry. 5th ed. India: Elsevier; 2012. Cawson RA, Odell EW. Essentials of Oral Pathology and Oral Medicine. 6th ed. London: Churchill Livingstone; 1998. Massler M. Pulpal reactions to dental caries. Int Dent J 1967;17:441-60. Levine RS. The microradiographic features of dentine caries. Observations on 200 lesions. Br Dent J 1974;137:301-6. Johnson MW, Taylor BR, Berman DS. The response of deciduous dentine to caries studied by correlated light and electron microscopy. Caries Res 1969;3:348-68. Marzuki AF, Masudi SM. 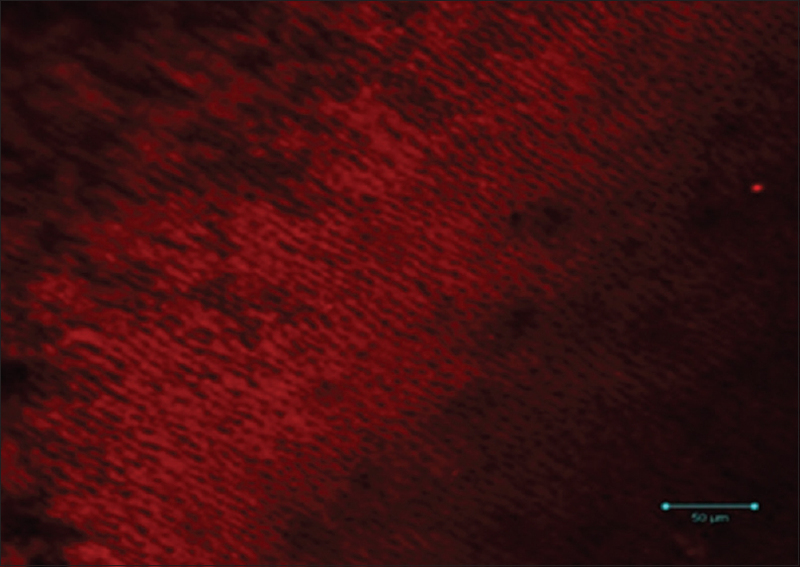 Confocal laser scanning microscopy study of dentinal tubules in dental caries stained with alizarin red. Arch Orofac Sci 2008;3:2-6. Kagayama M, Sasano Y, Sato H, Kamakura S, Motegi K, Mizoguchi I, et al. 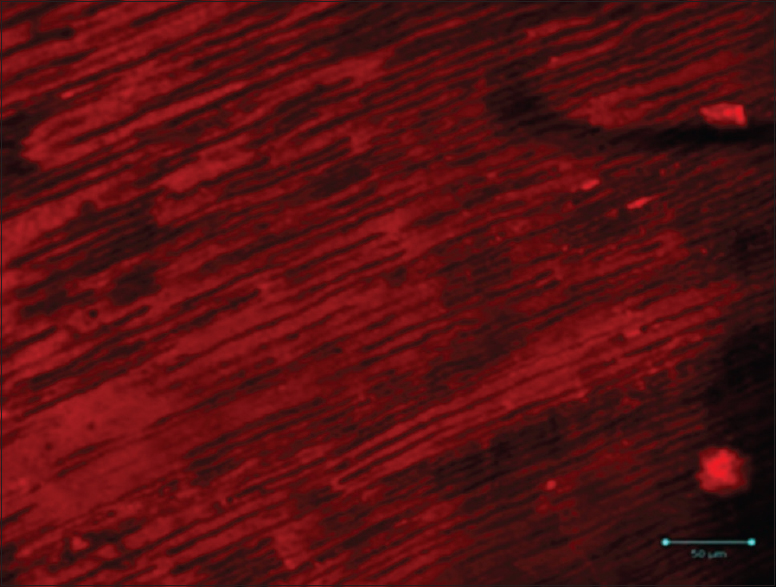 Confocal microscopy of dentinal tubules in human tooth stained with alizarin red. Anat Embryol (Berl) 1999;199:233-8. Nishikawa T. Pathological findings on the progression of carious lesion. Shika Igaku (J Osaka Odontol Soc) 1998;2:135-9. Arnold WH, Konopka S, Gaengler P. Qualitative and quantitative assessment of intratubular dentin formation in human natural carious lesions. Calcif Tissue Int 2001;69:268-73. Fejerskov O, Nyvad B, Kidd EA. Clinical and histological manifestations of dental caries. In: Fejerskov O, Kidd EA, editors. Dental Caries – The Disease and Its Clinical Management. London: Blackwell Munksgaard; 2003.